The Shetland Sheepdog or "Sheltie" is a small, strong, nimble and lightly built dog breed, making it a fast runner and an able jumper. The breed combines the speed, endurance, agility and intelligence to be an outstanding herder. From a young age, Shetland Sheepdogs demonstrate a desire to please their owners, which make this dog breed easily trainable and an ideal family pet. Male Shetland Sheepdogs range from 13 inches to 15 inches. Female Shetland Sheepdogs range from 12 inches to 14 inches. Male Shetland Sheepdogs range from 14 to 18 pounds. Female Shetland Sheepdogs range from 12 to 16 pounds. Shetland Sheepdogs colors range from black to sable to golden or mahogany marked with different amounts of white or tan. 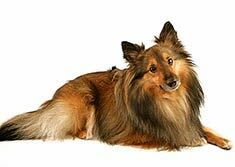 Shetland Sheepdogs outer coat is long, straight and harsh, while the undercoat is short and furry. Their coat requires regular brushing. The Shetland Sheepdog is intelligent and willing to please. 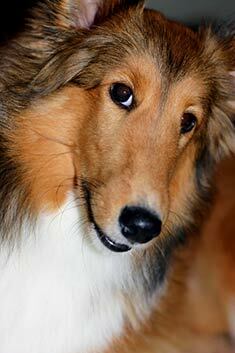 Gentle and playful, the Shetland Sheepdog does well with children. The Shetland Sheepdog is susceptible to disease of the eyes. The expected life span of the Shetland Sheepdog is 12-14 years. Shetland Sheepdogs will do well in apartments as long as they are given sufficient amounts of exercise. The Shetland Sheepdog is in the Herding group. Find Shetland Sheepdog Puppies with our Free Breeder search!